Monitoring and control (SCADA) systems consist of several server and client computers organized in a special network inside the authorization zone to control and monitor the system from control center. In some conditions, there are more than one server computers working as redundant partners. The special software namely SCADA / HMI / MMI (Supervisory Control and Data Acquisition / Human Machine Interface / Man Machine Interface) or SCMS works on these computers for monitoring and controlling of the system. Operators monitor and control the system through server and client computers according to their authorizations. SCADA software presents the online data which is received from PLC/RTU through communication network. The data is represented to the operators on the screen as mimic diagrams, event/alarm lists and saved to databases, printed and performed high level automation functions by using well organized and prepared software codes. With the help of high visual presentation opportunities of SCADA systems, general condition of the system can be monitored through several diagrams as main screen, single line diagram, and diagnostic views and conditions of field equipment’s can be monitored easily. HMI screens provide several control capabilities and system can be controlled easily and effectively by sending commands. Actual and previous warnings, faults and alarm conditions can be monitored in detailed form through the Event/Alarm lists screen. All the critical changes, which occur at field, are transmitted to higher system as time stamped on the source of the signal and they are presented and saved as time chronological lists with 1 ms resolution. Events and alarms can be formatted and grouped according to several criteria. Alarm/Event data can be monitored with all required information detail (as source, reason, time, place, operator, description) and archived in databases for the inspection of authorized staff and can be easily reviewed and printed out. Also, it is possible warn operators by visual and audio warnings. Remote users can be informed by web integration, cell phone and mobile systems. Different measurement information can be monitored and saved on hard disk or database as actual and cyclic values. Records within particular cycles can be inspected. Saved values can be monitored as actual time or historical trends which can contain one or more values. Detailed reports can be created for several periods and criteria. Energy consumption of subunits can be billed with different unit prices and parameters. Also, all data can be transferred higher systems and authorized people by wide communication opportunities as online. Actual and historical trends of values in the field with respect to time can be monitored and saved. Besides, values can be transferred to standard software (like MS Office products) and web servers or higher management systems through network. Energy automation systems provide effective communication opportunities through standard communication protocols like IEC 60870-5-101 / 102 / 103 / 104, IEC 61850. Not only the event/alarm lists but also supporting facts like type, time and reason of event/alarm can be transmitted. Secure communication channels can be established. Automation SCADA products are open systems which support several products of RTU/PLC manufacturers through standard communication protocols and integration opportunities as ODBC, OLE, OPC, DDE. 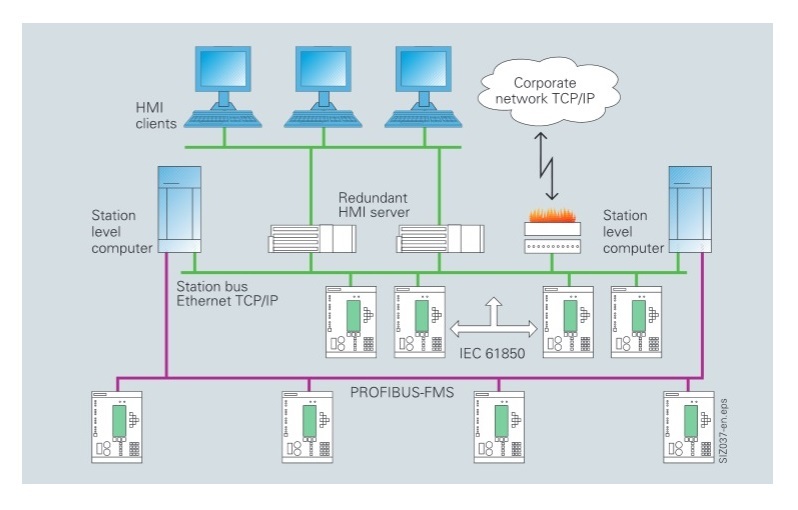 With the help of flexible configuration opportunities, it is possible to extend automation systems from small configurations to huge automation systems which can monitor and control very large facilities from one or more points. With the help of standard data communication protocols, manufacturer independent integration opportunities are wide. Protection relays and SCADA systems, which are produced by different manufacturers, can work together without any problem. Integration to auxiliary software’s like web applications and office software’s can be created with the transmission of data to the standard software’s like ODBC, OPC, and DDE. Maintenance team can be informed and can be directed immediately by integrating with user interfaces as mobile devices and smart phones. Higher systems and remote users can be informed with actual data by the online integration with web servers and higher level management systems. Authorized staff can be informed in details and operators can use the system efficiently by integrating with auxiliary platforms as simulation systems and geographical information system.